We have a love–hate relationship with soccer in our household. My 12-year-old loves it, and the rest of us hate it. Maybe hate is too strong a word, but come on! Soccer games are 1-1/2 hours long. With crazy rules like you can't touch the ball with your hands. I may have mentioned it once or 12 times, but I played basketball in high school and college. So did my husband. You might say that we think highly of the game of basketball, especially since it is the greatest sport ever played by humankind. We naturally assumed that our eldest daughter would become a star basketball player. Instead she decided to become a star soccer player. The nerve of that kid. Now that she's about to enter 7th grade, my daughter is looking forward to participating in school sports. 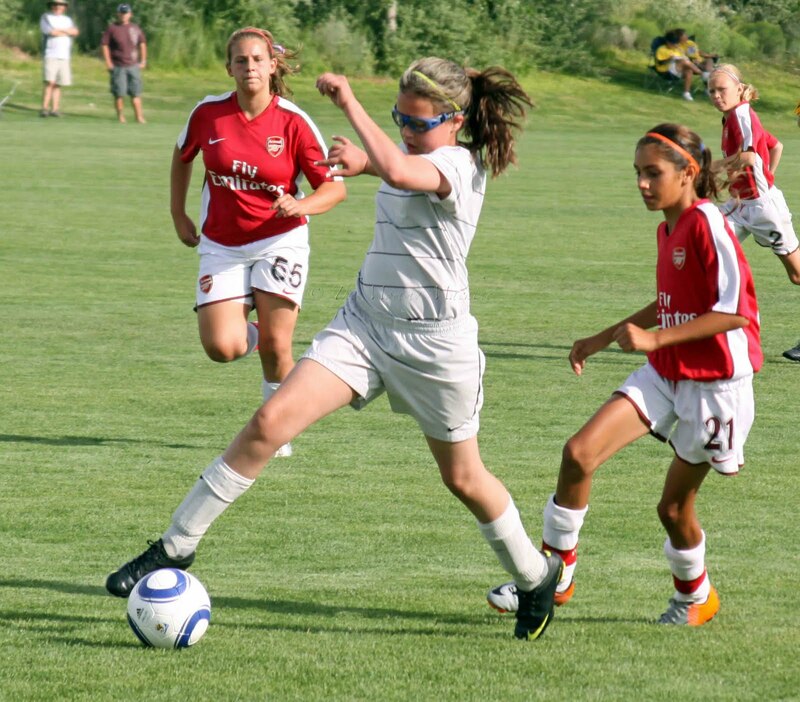 Unfortunately for her, but quite happily for us, Alaska junior high does not offer soccer. They compete in cross-country running and skiing, volleyball, track and field, and BASKETBALL. That's right. We'll win her over yet. I feel your pain. Here's hoping for better days to come! I feel the same about soccer but that is too bad they don't have it at the school. With your luck maybe she'll join ALL of those sports PLUS a community soccer team? haha. How ironic that in your "one year ago" link it's about you being a soccer mom! Love it!! We're a soccer family here. If she needs a safe soccery haven, we're but a few thousand miles away! I used to think soccer was a silly game, until my husband (the high school and college soccer star) taught me all about it during World Cup 2006. Now, I love it. Rachel played one year, and she didn't like it that well. Needless to say, Brett was a wee bit disappointed. Awesome picture! Wow. Great action shot.